Eleven years, five books. A degree, two co-op jobs and three career jobs, five residences, a marriage and half a dozen broken bones. It's been a pleasure sharing it all with you, I sincerely couldn't have asked for a better audience. To those I've met, and those I haven't yet, I'm honoured to have been a part of your life. Thank you for welcoming me to it. This is the end of weekly updates, but rest assured it isn't the end of rainy days, jammyness, shenanigans, engineering triumphs, or stories I wish to tell. Submitted by tancque on December 5, 2016 - 1:21am. Good Luck and thanks for bringing a smile every week! Submitted by McTwitch on December 5, 2016 - 1:32am. Thank you so much for all the years of great work! Can't wait to see where you go from here! Submitted by Fuseblower on December 5, 2016 - 2:51am. Submitted by 1nutty1 on December 5, 2016 - 3:02am. Signed up so I could wish you all the best in your future endeavors. Submitted by Elyandarin on December 5, 2016 - 6:42am. Thanks for all these years of comics! I wish you best of luck with your life from here on! Submitted by elgefe on December 5, 2016 - 8:41am. I haven't posted in over 5 years, but I had to be here to say Thank you! Thank you for so many amazing years of comics. I really hope we'll see more of your creative projects in the future. This comic was what finally motivated me to graduate so many year ago. I'm sad to see you go, but glad that it's ending on your terms. Best wishes, Jam, the future is looking good. Submitted by NotDido on December 5, 2016 - 9:38am. Made this account today to comment, but I've been reading since I was in middle school. I especially loved all your college stories and this year I'm a freshman at college reading your Real World career stories. (It'd be great to say I'm also a woman in engineering or something, but I'm in linguistics. You're still a great inspiration :D) Thank you so much for sharing with us for all these years. Submitted by TPMF on December 5, 2016 - 10:44am. Thank you so much for all the work and heart you put into this comic. I just graduated from college with an engineering degree and your comic has been an amazing source of comfort, humor, and reassurance since I found it years ago. Thank you again, and I wish you all the best and success in your life! Submitted by Umegaki on December 5, 2016 - 11:08am. Jaaaaaam ;____; You're making me cry over here, lady. I'm gonna miss my weekly dose of Jammy life! Thank you so much for sharing this comic with us for so long. Best of luck to you! Submitted by ouka on December 5, 2016 - 12:08pm. It's true, after over a decade of regular updates, I'm bringing Wasted Talent to its conclusion. I've put a lot of work into making the ending of this comic as good as it can be, and we'll see that rolling out in bi-weekly updates leading up to the final update on Dec 5th. 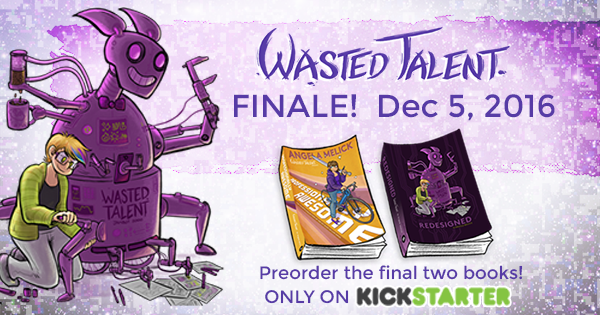 Meanwhile, I'm running a Kickstarter for the final two collected print editions. I'll only be printing as many as I need to fulfill the Kickstarter, so if you're interested in that DON'T WAIT! I've been hearing your messages all day about how you'll miss Wasted Talent and they've been really touching and sweet, thank you! Of COURSE I'm going to miss the comic too, and honestly the wonderful community we've built together here is what kept me going for so very long. Rest assured that if you want, there will be a way to keep my creative pursuits in your lives going forward, and I honestly believe that my comics from here on out are only going to get better and better.